The show is up and looking great! I will continue showing you pieces you haven't seen. This one has been a favorite of all who visited my studio. 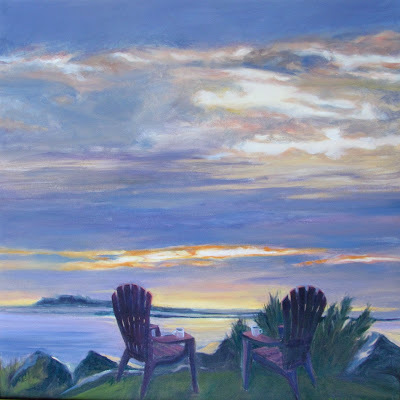 It's called "Conversation"
In May, I exhibited my series of Coastal Sunrises at the Marblehead Art Association. Twenty five paintings grew out of a week at Goose Rocks Beach in Kennebunkport, Maine. I had this canvas started but not completed in time for that show. So I took the sky I had started, and added the foreground from two resources: a photo of the grass and rocks, and directly from the chair in my studio which I posed one way and then another. Then I gave each chair a coffee cup. This has two chairs – one for me and one for Mom – so I can show her the show she missed because she was not able to come.